Note: The MSc Green Electronics programme replaces the previous MSc Microelectronics programme, with an updated curriculum that is tuned to the changing needs of the industry. 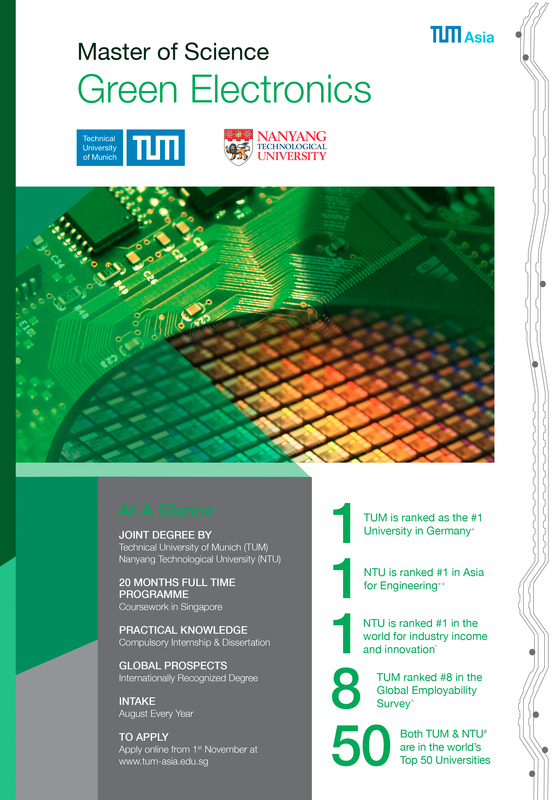 The Master of Science in Green Electronics is a highly specialized programme which is jointly offered by Nanyang Technological University (NTU) and Technische Universität München (Technical University of Munich, TUM). This programme aims to educate next generation semiconductor researchers and engineers to work in the research areas of novel electronic/optoelectronic devices and systems, with particular focus on the energy, sensing, monitoring and manufacturing fields. Through the 2-year full-time programme, the student will gain comprehensive and in-depth knowledge of micro-/nano-fabrication technology and advanced theories for renewable energy, power semiconductors as well as organic semiconductor devices and systems. The topics covered in this program deal with the state-of-the-art research and industrial developments. Essential non-technical topics such as product marketing, international management, patent law and aspects of culture and globalization will also be covered in the coursework. These non-technical courses will be given mainly by lecturers from the industry. Upon the successful completion of the programme, the student will be awarded a joint Masters degree from NTU and TUM. For information on programme details, duration & admission requirements, kindly download our brochures below. Please take note that these brochures are for personal reference only, and should not be used for other purposes. TUM Asia is not responsible for the misuse or misrepresentation of the stated information within the brochures. All information is accurate to the time of publishing. Updated August 2018. In order to be eligible for the programme, you must have at least a Bachelor Degree** (completed in at least three years, depending on factors such as the rest of your education background) in Electrical/ Electronics Engineering or in a closely related discipline with remarkable results. A good understanding of semiconductor physics, electromagnetics and organic chemistry (or electrochemistry) is preferred. *If you meet the requirements for admissions, please refer to this page (Click on “Required Documents”) for the List of Required Documents for application to our Master of Science programmes. **Academic requirements may differ for different countries of study. Please write to us at admission@tum-asia.edu.sg to verify your requirements. As the Master of Science programme’s instruction medium is English, the applicant must be able to demonstrate a satisfactory level of proficiency in the English language. Additionally, an Akademische Prüfstelle (APS) certificate is required for applicants with education qualifications from China, Vietnam or Mongolia. The APS certificate is compulsory if your Bachelor studies was completed in a Chinese, Vietnamese or Mongolian university, irregardless of nationality. For example, a Singapore citizen who completed his entire undergraduate studies in a Chinese university, and holds a Chinese degree, must sit for the APS test and pass it in order to qualify for admissions to a German university. If you are making any application to a German university (including the TUM degrees at TUM Asia), the APS certificate is required for all education qualifications from China, Vietnam or Mongolia. If you need more information, please contact our team. Successful completion of this program will equip students with the capabilities in the following technical areas: 1) Conventional semiconductor manufacturing technology which includes the materials, devices and manufacturing process. ; 2) Carbon and organic electronics, photovoltaic, sensor and display technology which include the corresponding materials, devices and manufacturing process; and 3) Green technology for energy harvesting, wireless sensor networks and cyber systems. The teaching faculty in the programme are predominately from TUM and NTU, as well as additional modules taught by industry leaders and other expert academics. Single yearly intake, with course commencement in August every year. All coursework are conducted in English and students will be taught by German and Singaporean lecturers. Student-teacher ratio averages between 20:1 to 35:1. Only live teaching is conducted in all TUM Asia classes. All examinations will be written by the student him/herself, and examination results are released approximately 1-3 months after the examination. The Master of Science in Green Electronics degree is a 2-year full-time programme. Students must complete their coursework, 3-month internship and 6-month of Master Thesis writing to qualify for graduation. In order for a student to graduate, he/she must obtain a minimum overall CAP score of 4,0 or below and CGPA score of 2.50 or above. An academic warning will be issued to students if their CGPA score falls below 2.50. There is also a risk of candidature termination for failure in any modules if overall CGPA score falls below 2.50. A student will successfully complete his/her degree course in the n+2 year, n being the year of enrolment and assuming the circumstances that the student will not have any failed modules that he/she is required to retake. For example, if a student is enrolled in August 2017, he/she is likely to complete the course by August 2019, subject to the fulfilment of the graduation criteria. Advanced gate oxide formation. Thin film deposition. Lithography and resist. Technology etching process and technology process. Integration metrology and analytical techniques. Low-k dielectrics. Chemical and mechanical polishing (CMP) cleaning technology. Bonding between atoms. Electronic and atomic structures. Basic crystal structures. Energy band. Semiconductors, insulators and organic materials. Defects and doping. Surface and interface. Functional properties of materials. Compound semiconductors. Nanostructures. Electronic ceramics. Introduction to bionanotechnology. Materials: electrolytes, organic molecules, lipid bilayers, DNA, proteins. Nanofabrication techniques and self-assembly. Biofunctionalization of solid surfaces. Surface analytics and characterization. Electrical biosensors: solid-liquid interface, surface plasmon resonance, quartz microbalance, electrochemical impedance, nanopores, nanowires. Charge transfer in biomolecules: fundamentals and applications. Approaches to nanotechnology: bottom-up vs. top-down. Characterization and fabrication issues in the nanoscale. Applications of nanotechnology in electronics, optoelectronics, telecommunications, medicine, biology, mechanics and robotics. Overview of nanotechnology programs in USA, Japan and Europe. Nanomaterials and nanosystems for energy applications. Examples of nanotechnology energy production, energy storage, energy harvesting, and high voltage technologies. A look into the future: electro and photocatalysis, hydrogen production and storage. Economical implications of nanotechnology in the energy field. The course will focus on the operational principles and underlying physical effects of microstructured electronic and mechatronic devices and microsystems and their application fields. In particular, the course will address the following topics: Basic physical effects in solid-state microstructured electronic and micromechatronical devices and their application fields (microelectronics, microsensors, microactuators, and microsystems). Characteristic material properties of semiconductors: Intrinsic and extrinsic electrical conductivity, mobility, charge carrier transport by drift and diffusion, carrier generation-recombination, thermal conductivity, energy domain coupling effects (thermoelectricity, piezoresistance, piezoelectricity, thermoelasticity, galvanomagnetism etc.). Basic operational principles of microdevices: pn junction, MOS field effect, unipolar and bipolar electronic devices, power devices, various transducer effects. Phenomenological transport theory: Onsager´s transport model, continuous field models of energy-coupled multi-domain systems, physics-based macro-modeling of microsystems. Selected sensor and actuator application examples. Interaction of microelectronics, micromechanics and microoptics. Properties of light. Laser-based measurement systems. Optical interferometry. Wafer surface analysis. Shape and deformation measurement. Stress measurement. Stress sensors. Optical waveguides. Application-oriented measurement devices. Process models: diffusion, oxidation, implantation. Process variables/targets: doping profiles, junction depths, oxide thickness. Process simulation: Simulate a given sub-micron CMOS process recipe and study profiles and layer structures. Physical models. Numerical algorithms and solutions. Device performance parameters. Short-channel effects. DC simulations. Device simulation: Simulate the DC characteristics of the “fabricated” device and analyze device operation with respect to potential, field, and carrier distributions as well as terminal I–V characteristics. Wafer-split experiment. Device-target vs. process-variable relations. Transistor performance optimization/trade-offs through process variation. Technology development and optimization. Design of Experiment (DOE): Implement a computer experiment to study the scaling characteristics (varying gate length) of the given sub-micron technology. Study the influence of process variations on device performance parameters. Part I includes MOSFET analytical equations, short-channel effects, compact model for circuit simulation, parameter extraction, and transistor optimization. Part II includes semiconductor fundamental, simulation of Si, Ge, and Sn band structures, Quantum well (QW), Energy subbands and wave functions, kp method. It also covers QW band structure calculation by using single band and 6-band kp method, density of state, doping concentration, and Fermi energy level calculations by using single band and 6-band kp method. Intersubband (intraband) transition, squared transition element calculation, absorption spectrum, and cut-off wavelength of QW infrared photodetector is also discussed. The influence of Ge composition and well width on peak wavelength of photodetectors and optical gain simulation of Ge QW on Si is also covered. The course focuses on the skills needed to communicate research effectively and confidently in a variety of situations. Particularly, the focus is on technical writing, oral presentations and the interpersonal and intercultural communication skills required. Students will learn and develop effective strategies for writing and presenting their research findings in academic and professional situations. The course is also designed to enhance English communication competence in these settings. Structure of the power system: generation, transportation and distribution and electricity consumption. Introduction to typical power plant types including new renewable technologies. Description of the transport, distribution and control philosophy. Introduction to the electricity demand, especially due to new electronic services. Fundamental terms of energy economy and electricity markets. Introduction into smart grids. Low power flexible displays. OLED displays on flexible substrates. Printing processes for information displays. Evolution of Visible-Spectrum light emitting diodes. LED design principles. Visible-Spectrum LED. White LED. Current topics in solid state lighting. Energy flow in environment. Optical properties of nanomaterials. Spectral selective windows. Solar thermal collectors. Solar cells. Cooling and energy harvesting. Electrochemical energy storage. This course will focus on fundamentals of electronic and optoelectronic devices and technologies based on polymer semiconductors. Organic electronic technology uses new semiconductor materials based on carbon compounds such as organic small molecules or polymers. These materials can be chemically synthesized to tailor a variety of their semiconducting properties making them appealing for applications that require luminescence (LEDs), transport and charge mobility (transistors), the absorption of light (photovoltaic cells), and the modulation of such properties due to external stimuli (eg, photodetectors, gas and pressure sensors). In addition, these materials are mechanically flexible and have also the intrinsic ability to be deposited over large areas on both rigid and flexible substrates by printing techniques (for polymers soluble in organic solvents) including ink jet or screen printing. This is why this field is also referred to as plastic or printed electronics. In particular, the course will address the following topics: Polymer electronics: an overview. Electronic structure and band theory. Beyond polyacetylene. Optoelectronic properties. Charge transport. Synthesis and macromolecular design. The physics of polymers. Surfaces and interfaces. Polymer transistors. Optoelectronic devices. Photovoltaic devices (organic and dye sensitized solar cells). Polymeric memories. Historical development of mainstream MOSFETs until today: economical, technological and physical fundamentals. Properties of long channel and short channel MOSFETs. Hot carrier effects, scaling rules, basic of charge carrier transport (quantum-mechanical, hydro-dynamics, ballistics). Proposed new MOSFET structures (vertical MOSFETs, double-gate, fully-depleted MOSFETs). Hot-electron transistors, tunnelling transistors, low-dimensional devices, single-electron transistor, single-electron memories, quantum-electronics. The course will focus on the function and operational principles of today´s semiconductor power devices and their use in specific applications. In particular, the course will address the following topics: Fundamentals of semiconductor device physics: electronic band structure, intrinsic and extrinsic conductivity, mobility, carrier transport by drift and diffusion, carrier generation and recombination, impact ionization, pn-junction, MOS field effect. Power device structures: PIN diode, Schottky diode, bipolar junction transistor, thyristor, power MOSFET, insulated gate bipolar transistor (IGBT). Robustness and destruction mechanisms of power devices: thermal breakdown, electrical breakdown, dynamic avalanche, latch-up in IGBTs, cosmic ray induced failure. Understanding intercultural aspects, government structures and differences in European and Asian religions in business and private environment. Basic comparison in European and Asian modern history. To familiarize students with the basic principles on international economics and the problems and issues of the world economy as well as the terms used such as liberalism, mercantilism, free trade, protectionism. Topics on contemporary debate related to globalization, concepts, theories, goals, and the main actors and the various opponents of a global economy, e.g. nongovernmental organizations, antiglobalization movement, lobbyists, nationalist movements are covered. Students will also examine the social and cultural impact of globalization, especially the transformation of local societies throughout the world. Topics are like the spread of religions across cultural borders, the replacement of local culture by popular culture, the impact of science and technology transfer, or the growing ethnic diaspora community worldwide etc. This module will give a brief introduction to intellectual property rights, and focus on insights into general principles of patent law and international conventions governing the patent law. Current developments and criticism of the current patent law system will also be addressed. In addition practical (legal) aspects of the commercialization of patents will be dealt with. In this seminar, the fundamentals and basics of business administration are discussed in various examples from companies in Asia and Europe. Starting with the fundamental business theories, we soon come to the hard facts – how to run a company in a competitive environment. What factors make a company successful? How does a company become a global player and what risks exist in the market? How do companies deal with competitors and how do they find out what the marked, i.e. their customers, demand? “Strategic management” is the key to answer these questions as well as “Strategic competitiveness”. We will further discuss the fundamentals in M & A (mergers & acquisitions) – how to estimate the value of a company and a global brand (branding). Diversification contra specialization – several case studies will point up the different management theories. This is an interdisciplinary approach to leadership and management with insights into Sun Tze’s “Art of War” and The Bhagavad Gita, linking Confucian ethics with Buddhist economics, with highlights of idiosyncrasies in doing business in Asia like Feng Shui, hampers and Guanxi. Key aspects of doing business in ASEAN, China and India will also be discussed. *Disclaimer: Elective modules available for selection are subject to availability. Unforeseen circumstances that affect the availability of the module include an insufficient number of students taking up the module and/or the unavailability of the professor. TUM Asia reserves the right to cancel or postpone the module under such circumstances. After two semesters of coursework, all students have to complete a (minimum) two or three month internship with the industry or with an academic institution. It is required for the student to complete an internship related to his or her field of study at TUM Asia. There will be an informative briefing session conducted for all students to equip them with the necessary knowledge regarding internship and thesis guidelines of TUM Asia. This briefing will be held during the first semester of your studies at TUM Asia. The total tuition fees for this Master programme is S$ 34,240.00* (inclusive of 7% GST). From AY2018/19 onwards, the tuition fees will be paid in Singapore Dollars only. The tuition fees are to be paid in three instalments as indicated in the table below. *Tuition fees are subject to revision due to currency fluctuations at the discretion of TUM Asia. All prices stated above are inclusive of 7% GST. DISCLAIMER: The tuition fees stated on this webpage are accurate to the Academic Year 2019/20 intake only. Students from previous intakes should not refer to the total fee stated on this webpage as their reference. *For no. 2 to 9, the fees are payable to the Nanyang Technological University (NTU). The respective amounts and payment instructions will be provided in the Student Agreement to all successful applicants.